Cranial hemophilic pseudotumor (cHPT) is a very rare disease, which is easy to misdiagnose. It is also difficult to manage such patients. We reported the first case of occipital cHPT. Here, we presented a rare case of an occipital bone mass in a 3-year-old boy who was diagnosed with hemophilia A. The mass was misdiagnosed as an aneurysmal bone cyst by pathological examination. After resection, the patient underwent one-stage cranioplasty. However, the patient was admitted again for hematoma caused by an invasive procedure. A second surgery and one-stage cranioplasty were performed at the same time. A follow-up 3 months after discharging showed the patient was uneventful, and the titanium mesh was well fixed. The diagnosis of cHPT requires the combining of history, radiological examination, and pathological examination. Resection is the best choice for symptomatic cHPT. Replacement treatment and less invasive treatment can make perioperative management safer. One-stage cranioplasty for resection of an occipital cHPT can improve the quality of life. Hemophilia could cause severe hemorrhage complication but is rare in the skull. 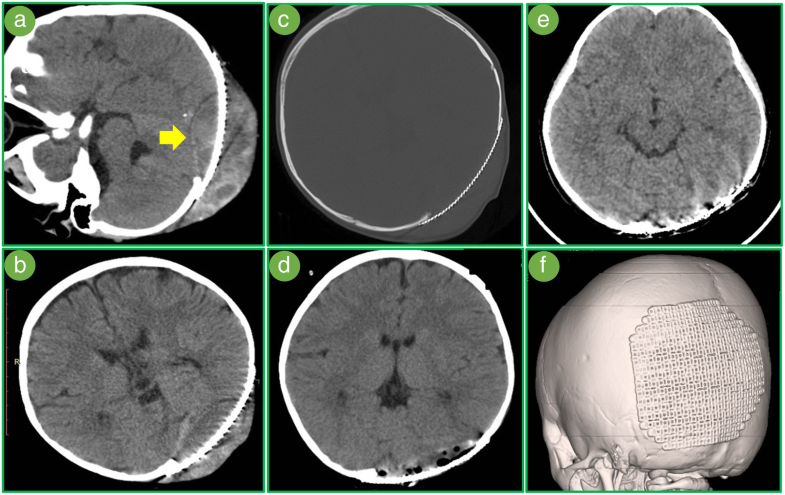 The cranial hemophilic pseudotumor (cHPT) is a severe complication, which occurs in 1–2% of hematoma in hemophilic patients [1, 2]. It is easy to misdiagnose and delay the treatment because of several similar diseases, such as the aneurysmal bone cyst (ABC). [3–5]. Perioperative management and neurosurgical intervention for hemophilic patients are both challenges [2, 4, 6]. In the following cases, we presented a case of HPT patient and describe our diagnosis and treatment experience in this disease. 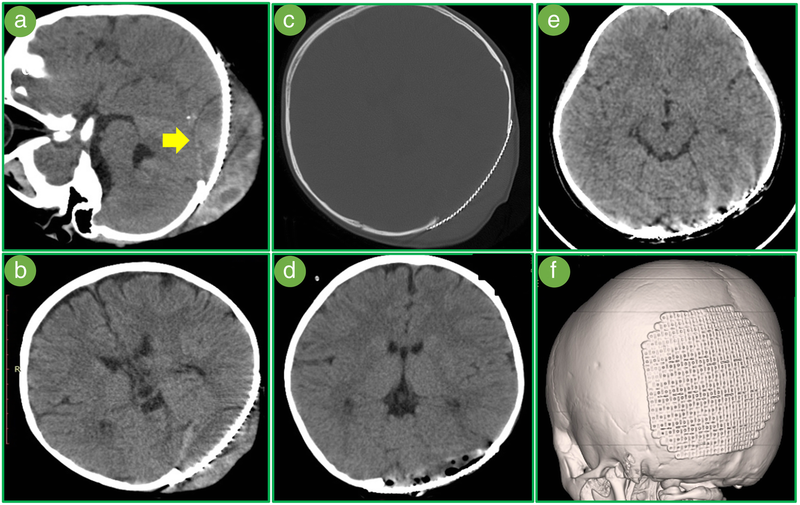 A 3-year-old boy was admitted for progressively enlarging occipital mass and persistent headache. The mass was found 1 year ago and grew obviously within 2 months. The child had a traumatic history in the occipital (about 1.5 years ago). Magnetic resonance angiography (MRA) did not find obvious arterial supply within the lesion (Fig. 1a). CT suggested an irregular destruction of the occipital bone and small cysts within the lesion (Fig. 1b). Magnetic resonance venography (MRV) showed that the left occipital sinus was blocked totally (Fig. 1c). Laboratory examination on admission suggested that the activated partial thromboplastin time (APTT) was prolonged (64 s), and the clotting factor VIII was decreased (48.4%). The hematologist considered the patient as a hemophiliac. A replacement treatment was subsequently performed using massive fresh frozen plasma (FFP). After controlling the APTT within 11.6 to 15.9 s, the coagulation was subsequently monitored for 2 days. Confirming that the coagulation was suitable for surgery, surgical resection was immediately arranged. What we saw intraoperatively was an organizing hematoma with scattered calcification, massive fibrous tissue hyperplasia around the lesion, and several small bony cysts within the lesion. After total resection, one-stage cranioplasty was performed too. The volume of intraoperative bleeding was 300 ml. Postoperative CT was negative (Fig. 1d). After the operation, we continuously monitored the coagulation condition. On the third day, a pinpoint errhysis and prolonged APTT (32 s) were found. A replacement treatment was performed immediately using FFP. No signs of hemorrhage were subsequently seen until discharge. The final pathological diagnosis was cranial hemophilic pseudotumor (Fig. 1e, f). The patient was admitted for subcutaneous hydrops 12 days after discharge. A puncture was performed. One hour later, the patient felt nausea and headache. 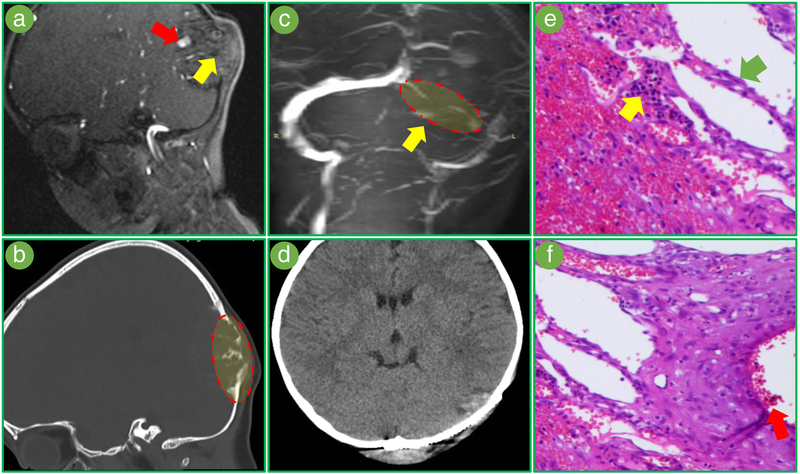 A compression and sign of cerebral hernia caused by epidural hematoma was found on CT (Fig. 2a). A coagulation examination showed coagulation function was catastrophic (APTT 50.3 s, factor VIII 32.1%). Thus, a replacement treatment was performed until the APTT was significantly improved (21.6 s). A surgery was immediately performed for cerebral hernia. Intraoperatively, plasma transfusion was continued. A one-stage cranioplasty was subsequently performed after evacuating the hematoma. The magnitude of intraoperative bleeding was 500 ml. Postoperatively, the APTT was still abnormal but no signs of bleeding were found. A hematoma was still visible on CT but showed no signs of enlargement (Fig. 2b). The mesh was fixed well (Fig. 2c). On the third day after the operation, we found that APTT (39.6 s) was prolonged again. A replacement treatment was then performed using FFP. Four days after surgery, hematoma was significant absorbed (Fig. 2d) and the APTT was improved (32.7 s). The wound was healing well. Three months after discharging, a radiological follow-up showed the titanium mesh healed well with surrounding tissue without subcutaneous hydrops (Fig. 2e, f). The patient can live as normal as before the operation without much change in appearance and neurological deficit. The cHPT is so rare that only seven cases of this disease have been reported (Table 1). Here, we reported the first case of occipital cHPT. It is difficult to diagnose a cHPT for similar features between cHPT and some diseases, such as ABC [7, 8]. They could both present as a progressively enlarging mass and the neurological deficit caused by the compression. The diagnosis of cHPT may be performed by radiological examination, which is defined as bone destruction and bony cyst containing fluid [9, 10], whereas ABC could also present as similar features . Even on histology, cHPT and ABC can share similar features, such as single fibrous capsule or multiple bony cysts containing bloody fluid [7, 9, 11-13]. However, we can still identify a cHPT by some features. Previous cases showed 5/8 of patients with cHPT had a history of head trauma, and a hematoma often occurred after injury but were often not well treated [2, 4, 10, 12, 13]. One year later, there will be a progressively enlarging mass within the injury region [2, 9]. Meanwhile, attention should be paid to history of hemophilia and relevant examination, which is not only important for treatment, but also important for diagnosis . A CT reveals numerous small cysts, and an angiogram shows the presence of poor arterial supply [7, 9], which could exclude the ABC. As for histology, it is very important for cHPT to recognize the hemosiderin-laden macrophages, which is easily mistaken as atypical giant cells . This is the main reason for the misdiagnosis of our case. The cyst walls were lined by giant cells for ABC , whereas hemosiderin-laden macrophages were dispersed within the lesions. Moreover, the ABC usually contains large cysts with obvious arterial structure , whereas the cHPT usually contains many small cysts with significantly organized hematoma and massive inflammatory cells infiltration . However, it is difficult to diagnose the cHPT based on single clinical features, and the above characteristics should be comprehensively considered. Fig. 3a summarized our experience of diagnosis for the cHPT. The surgical resection is the preferred treatment [14–16]. However, this treatment is only considered when patients have symptoms in order to decrease the mortality and morbidity [6, 16]. Whether the patient needs surgical intervention or not, replacement is an important treatment. Correction of coagulation to the normal can reduce the risk of intraoperative hemorrhage. This is especially important for child patients because hemorrhage can be fatal. Significant decrease of coagulation factors may occur on the third day after surgery, which should be monitored in time. FFP may need much more than the recombinant factor to reach the same effect [17, 18]. However, considering the recombinant factor is expensive and difficult to acquire, FFP is the first-line option. Avoid invasive operation in the case of unknown coagulation function. In our case, a puncture was performed in absence of coagulation function, which subsequently resulted in a hematoma. However, examination of coagulation function should be executed firstly if an invasive procedure is inevitable. Fig. 3b summarized our experience of management strategy for the cHPT. Due to the risk of postoperative bleeding and little impact on the quality of life, no one-stage repair has been reported in previous cases [2, 4, 10, 12, 13]. However, the resection of occipital cHPT will leave a bone deficit, which could hugely impair the patients’ living quality because of special sleeping position and easily hurting by external force. Thus, we recommended one-stage cranioplasty, especially for occipital cHPT. In addition to improving the quality of life, a one-stage cranioplasty could improve psychological status and neurocognitive function . We believed that these advantages were also confirmed by our present case. It can be seen that under good control of coagulation condition, one-stage cranioplasty is a very good choice for occipital lesions. The diagnosis of cHPT requires the combining of history, radiological examination, and pathological examination. Resection is the best choice for symptomatic cHPT. Replacement treatment and less invasive treatment can make perioperative management safer. One-stage cranioplasty for resection of occipital lesion can improve the quality of life. Qingyuan Liu and Jun Wu these authors contributed equally to this work. We thank our sponsor (Major special projects in the 13th five-year plan) for the financial support. This work was supported by “Major special projects in the 13th five-year plan” (Grant No.2016YFC1301800). The sponsors had no role in the design or conduct of this research. All authors contributed to the conception and design of the study . QL and JW contributed to the acquisition, analysis, and interpretation of data. QL drafted the article. All authors critically revised the article and reviewed the submitted version of the manuscript. SW approved the final version of the manuscript on behalf of all authors. SW and CL provided administrative/technical/material support. SW and CL supervised the study. Both SW and CL were corresponding authors of this case report because they made equal contributions to the surgical treatment of this patient. All authors read and approved the final manuscript. The authors stated that they had no interests. The work was approved by the Institutional Review Board of Tiantan Hospital. Written informed consents were obtained from their legally authorized representatives. Privacy of patient was effectively protected. Written informed consent for publication of this case has been acquired from the patient’s parents for academic exchange. All authors certify that we have no affiliations with or involvement in any organization or entity with any financial interest (such as honoraria; educational grants; participation in speakers’ bureaus; membership, employment, consultancies, stock ownership, or other equity interest; and expert testimony or patent-licensing arrangements), or non-financial interest (such as personal or professional relationships, affiliations, knowledge or beliefs) in the subject matter or materials discussed in this manuscript. The authors declare that they have no competing interests.